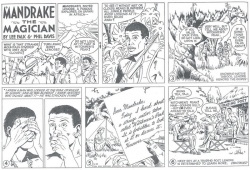 "Witchmen's Peak" is the 70th Mandrake Sunday story. The story was written by Lee Falk and drawn by Phil Davis. On safari in Africa Lenore hears a strange tale about the Witchmen's Peak, the place where the wich doctors are trained in black magic. And behind every throne in the jungle stands a witchman, the real power. Lenore writes in a letter a to her brother that she intends to explore the mysterious Witchmen's Peak. The letter is a month old Mandrake has not heard from her afterwards and think something must have happened. Lothar, hereditary King of the mighty Federated Tribes. The title for the story is given in the strip of June 3, 1956 (Next Week: "Witchmen's Peak"). This page was last edited on 6 March 2018, at 17:36.